When it is about presenting your business through the Internet or the virtual world to your customers and viewers globally the only thing that you can depend on is your official website. Yes, people get to know your business, the products and services that your business provides and your mission and vision of setting up this business is explained through an official website. So, you can say that a website is the face of your business in the virtual world. There is no other better way of presenting your business to the customers when they are looking for you on the Internet. Preparing an attractive looking website is certainly a daunting task. It definitely requires a well-planned strategy to design the website. You will have to take into consideration every petty detail that will be a part of your website like the images should be of high quality, the videos too need to be of high quality and most importantly the writing fonts that you use for the contents of your website should be attractive to look at and also should have contrast. A proper planning of these details will certainly make your website much better looking and attractive and will definitely be able to boost more traffic. For a more interesting reading font of contents play a very important role. It is necessary that an expert advice is always taken. 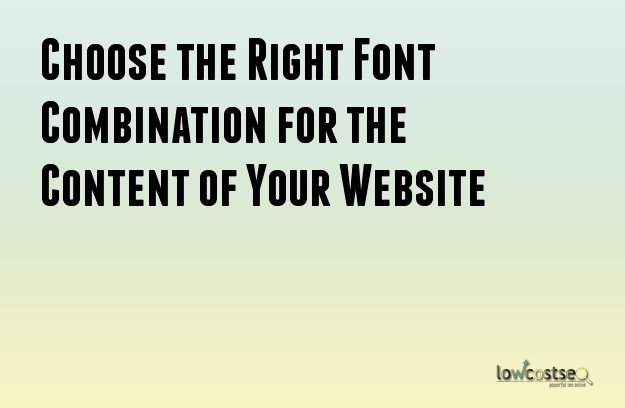 Here, is a list of fonts that will help in making your content more attractive looking. These are by far the most common form of fonts that are used for writing contents. This is considered to be the winning combination for writing contents. So, when you are planning to write contents for your website do keep this as an option. This is considered to be the most classic combination of the font that is present these days. There are people who do not prefer bold sized Helvetica this combination is mainly for them. One of the best things about this combination is that it is neutral and simple in nature. Helvetica is considered to be the most suitable partner for Garamond font. Baskerville is a classic font that was designed in the 1757 and this font when combined with Franklin Gothic which was designed in the 19th century gives a presentable look to the writing style. This unique combination makes the writing style look more sophisticated and elegant. When it is about writing headlines try and use a condensed version Franklin Gothic this will definitely draw the attention of the reader. Caslon font has a more robust looking appearance and it is characterized as per short descenders and ascenders with moderate stroke. It goes well with Univers font and gives an alluring appearance to the writing. It is advisable that you make use of condensed from of Univers font for a better display and look. When it is about giving a subtle appearance to your writing this is the best combination to use.